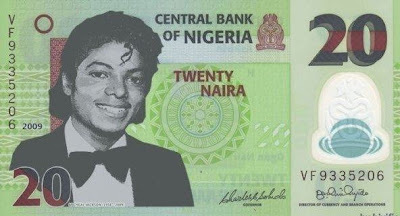 Maybe it should be the N1,000 note? Very funny. A man that had issues with his race to be imprinted on the currency of the world's largest black population. What would Michael be thinking now? Please don't all jump in with the vitiligo excuse. True story - was watching Jackson on TV and my friend was jotting down all the skin treatments that Michael had - chemical peel, bleaching etc for 'research'. all i can say is wetin concern agbero with overload!!!! i couldn't agree more with anonymous one! 'vitiligo' sufferers (eg the late stella obasanjo and titi Atiku) amoung us should explain their illness to us.